Over the past few years, both debt and equity crowdfunding have become increasingly popular ways for small growth businesses to raise the funds they need for expansion. But did you know that most companies which apply to raise funds through crowdfunding platforms are rejected before their pitch goes live? 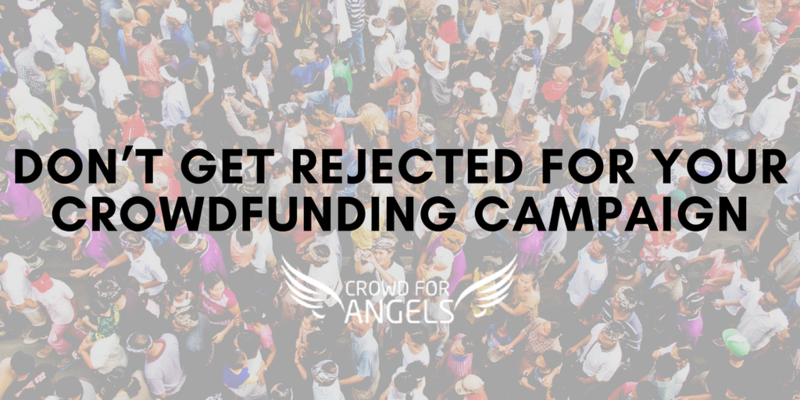 Since launch in 2014, Crowd for Angels has rejected 93% of companies to apply to raise money through its platform as they have failed to meet at least one aspect of a strict application process. This process seeks to ensure that companies are investment worthy before being put in front of investors who are going to be parting with their hard-earned cash. Here are five tips to ensure your business successfully gets its pitch to go live. At the initial stage of a pitch application, you will be expected to provide basic information about your business, such as its name and company number, as well as information about the directors and the nature and history of the business. All this will be checked against several third-party verification sites so make sure everything you provide is accurate and up to date. In the later stages of an application evidence will be required for every claim and statistic you use anywhere in your pitch, so be prepared to prove what you say. Make sure you get a professionally designed business presentation as part of your pitch application as it is upon this document which investors will base their view of your company. While not critical, think about making a video of your company’s products and services to showcase to potential investors what you can do. If investors are going to put money into your business they will want to how you are going to spend it. So in your application describe in detail how you will use your funds. Instead of vaguely saying you will spend the money on working capital, spell it out by saying you will spend £x on stock, £x on marketing and £x on staff costs for example. This shows that you have a well thought through plan and haven’t just made up numbers on the spot. One of the most difficult elements of a crowdfunding campaign, but one of the most critical, is what valuation to put on your company. Many businesses value themselves too highly when they look to raise money and this is likely to put off investors from parting with their cash. While valuing your business is not an exact science, you might like to consider some common methods, such as basing your value on a multiple of future forecast profits. Take a look at recent deals in your industry to get an idea of what kind of multiples investors are willing to pay. Investors in small businesses want to see that their interests are aligned with those of the people running the company. The easiest way to signal this is by management having invested funds in the company to get it to its current stage of development. This could be in the form of loans but preferably in equity. By owning some of the business themselves, management with an equity stake are showing that they will be sharing both the risks and rewards with investors, making the business a much more attractive proposition. Meet Crowd for Angels and other funders, as well as a broad spectrum of business service providers and entrepreneurs, at the Business Funding Show 2018, an all-day event on 22nd February at London’s East Wintergarden. Learn more and secure your early bird ticket at bfsexpo.com.